Thanksgiving and fall are a wonderful time of year to stay in and craft. My kids and I made a Thanksgiving Thankful Turkey craft for this Thanksgiving. This craft is an excellent way to sit down and be reminded of what we are thankful for. I thought it was adorable to sit down with children and hear what they are thankful for. Some of the things my daughter said surprised me. My kids might have moments where they squabble but she sure loves her little brother. This craft almost meant more to me than them, I think. I created this Thanksgiving Thankful Turkey Printable so that you can craft together at home with your own family. This is perfect for a homeschool lesson or a rainy day idea to share. No matter how you decide to spend the time together take a moment to reflect on things that are most important in life. 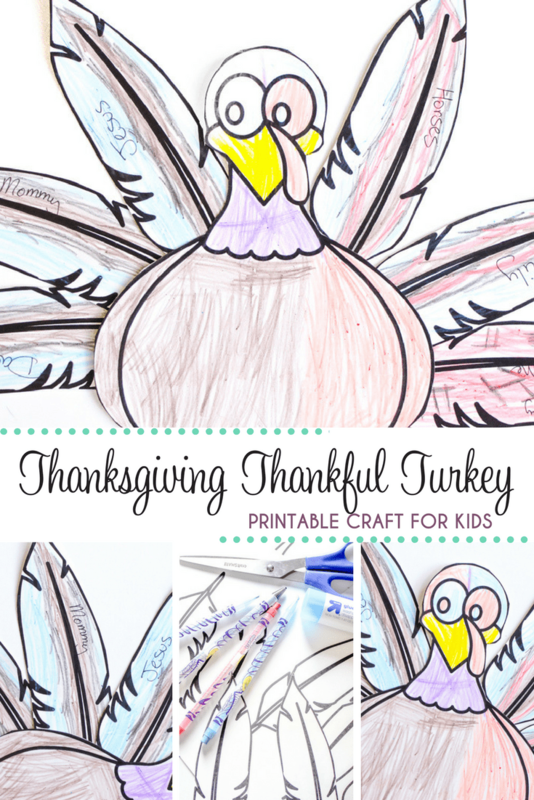 To begin this Thanksgiving Thankful Turkey craft simply print out the included printable in this post. It is free and simple. Use cardstock paper to print out the turkey and feathers for a sturdy craft you can hang on a window or stick to the fridge. Don’t forget to print out the printable! Once the turkey and feathers are printed, simply cut out each item. Have your child(ren) color the turkey first. With each feather that is colored, have them talk about what they are thankful for. Have them think of things they can either draw or write about on each feather. After everything is colored, glue the bottom portion of each feather to the back of the turkey. Ensure to glue colored side down on the back of the turkey so that the feathers show in the front. You can fan out the feathers however you wish. Let the glue dry and display the Thanksgiving Thankful Turkey as a reminder to always be thankful. Have a wonderful Thanksgiving with family and friends this year! Parents, check out what top gadgets will be helpful in the kitchen this Thanksgiving with my Thanksgiving List of Top 5 Kitchen Gadgets.